I could imagine Anna when she was a kid picking and sucking out the meat from these steamed crabs until her fingers turned wrinkly and raisin-like. She told me that most Cantonese grew up with the salty egg and meat patty combination but her father made it extra special by mixing it with steamed blue crabs. This was one of my best homecooked meals this summer. Be careful of the live crabs. One of them pinched me and it hurt! If you have some extra time before cooking, put them in the freezer for about 20 minutes so they “fall asleep.” Cracking them open later would not feel so bad. The best part of this recipe is pouring that super hot oil over the blue crabs before serving. Again, be very careful because the oil will be very hot, but oh, that crackling sound! 1. Open the blue crabs by pulling off the shell from the body. Remove apron and gills. Cut the crabs in half and using a pincher, smash the claws for easy access to the meat later. 2. In a bowl, combine the salted egg and regular egg and mix in the ground meat. 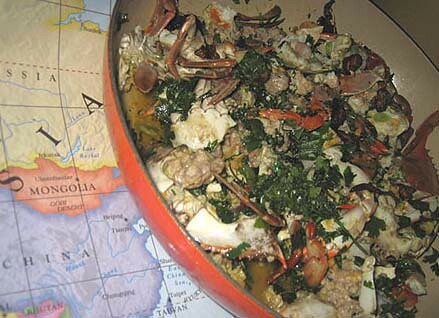 Using your hands, mash the meat in the egg mixture then pour over the blue crabs. Sprinkle with cilantro and scallions, saving some for later. 3. Using a large Dutch oven, steam the crabs for about 15 minutes or until the crab shells are deep orange. 4. In a separate wok, heat the oil and add the garlic. Without waiting for the garlic to burn, quickly but gently pour the hot oil over the plate of steamed blue crabs. Garnish with the rest of the cilantro and scallions.